It was a year of sequels that exceeded expectations. It was a year of women — directors, writers, cinematographers, actresses — succeeding against the industry odds to deliver many of the freshest and most inspiring big-screen visions. It was a year in which we turned to the movies for reassurance that there is still a benevolent imagination and a conscience at work in the world. And I’ve learned a lot from reading about this film — primarily, that a lot of people I respect really, really dislike Phillip Glass. Huh. I’m grateful, I guess, that I do not share their opinion. I barely noticed the music in this film — I think it served to effectively sew together a lot of “found footage,” typical National Geographic Special stuff (the kind that makes me suspicious that some things weren’t staged), and “glamour shots” of Goodall’s famous legs. But seriously — I’m more amazed by the abundance of footage of Jane’s early work that makes such a complete narrative possible than I am by the footage of her up-close-and-personal engagement with the chimpanzees. This is the kind of movie I would have been warned about in my childhood community of evangelical Christians. They would have condemned this due to their rejection of Jane’s scientific observations about evolution and her decisions about career, marriage and parenthood. (Many, I’m afraid, would still condemn it.) I’m grateful for teachers — men and women of deep faith and a deep respect for reason and truth — who came along to set me free from the notion that a work of art reflecting one human being’s ideas and decisions is automatically a film endorsing and celebrating all of those ideas and decisions. This film captures a testimony, but it does not preach — it leaves us room to observe Jane and come to our own conclusions (like, for example, realizing the folly of coming to anything at all like ultimate conclusions in a world as wondrous and complicated as this). In this film, Jane’s testimony strikes me as both an inspiration and a cautionary tale. Somehow, I’ve never known her story. I’ll go on thinking about her for a long time. Her fearless curiosity, her compassion, and her reverence for the created world minister to me (to preserve a word I learned in childhood) in ways that fear, ignorance, and condemnation do not. And they remind me of things I learned from those evangelicals’ own Scriptures: the importance of casting out fear, and of attending to “what has been made,” because creation is full of testimonies about what some call Mystery or Glory or Love — what (or better whom) I call God. The natural world is a language of its Maker, full of living words that go on speaking meaningfully to us. Jane and Janemake me want to attend to them better — with humility, discernment, and conscience. I want to be the jogger that Steve Coogan is. I want to prioritize family the way Rob Brydon does. I want to eat everything they eat. I want to drive the roads they drive. I want a road-trip buddy who enjoys improvisational sparring. It’s somewhat disappointing how preoccupied this film is with revisiting highlights from earlier material, with diminishing returns. (Again with the Roger Moore, Sean Connery, and Al Pacino! The Moors/Moores sequence is exasperating.) I’m increasingly weary of the celebrity-impressions competition between these two; I’m increasingly sympathetic with the unimpressed women at their table who demonstrate the patience of saints. But still, The Trip to Spain is a pleasure and a palate cleanser after a summer of disposable noise and typically overstuffed “big” movies. A film set in 1940 — wartime, in the months after the dramatic rescue effort during the Battle of Dunkirk. And I love it. It surprised me. Just when I thought I had it figured out, it would turn into something more than I expected. And here’s the biggest surprise: It stars Gemma Arterton. Their Finest was my favorite film about Dunkirk released this year. It’s a movie that *knows* it’s a movie, that wears its genre conventions on its sleeve, and that fumbles those conventional moments as often as it succeeds with them. But along the way, it finds flashes of real life that I found surprisingly affecting — surprising because the short blurb I read prepared me for a light romantic comedy. You can find romantic comedy here, but this film has higher ambitions. And that should be no surprise It’s directed by Lone Scherfig, who directed An Education. When I wrote Auralia’s Colors, I was determined to avoid any scenes that felt familiar in the fantasy genre — and so I avoided battle scenes, scenes of wizards facing off with monsters, etc. While there *are* wars in the story, we learn about them from their distant repercussions on others, or by picking up hints about them in dialogue and rumors. I find that much more interesting because the Big Spectacle Events have been done so often that they rarely ever interest or move me. Also, this movie has Bill Nighy. Who can make any more worth seeing (except, perhaps, Love, Actually). I look forward to revisiting this for the subtle pleasures it offers. I have no doubt that this is not meant as satire; this is the way the world works in so many societies (including, increasingly, my own). But Cristian Mungiu’s extremely narrow focus on corruption makes it difficult for me to be completely caught up in his vision. I was mightily impressed with Mungiu’s 4 Months, 3 Weeks and 2 Days, and Graduation is clearly a masterful work from the same truth-telling imagination. And this is a film about subjects that I care about deeply — namely, the value of integrity, and the importance of becoming a “living word,” an incarnation of one’s professed beliefs. Graduation, on that subject, would make and interesting double-feature with Ang Lee’s The Ice Storm: A parent’s integrity is their most influential form of teaching. There is much to admire here, from the understated performances (although Lia Bugnar plays one of the most zombie-fied victims of a loveless marriage since Allison Janney’s practically comatose character in American Beauty) to the meaningful complexity of some of the images (I wanted to grab screenshots of several moments just to study them, especially those in which religious icons are peering out at us from edges of the frame). Mungiu’s critique of Romeo’s quid pro quo relationships is so obvious and relentless from the beginning of the film that Graduation becomes increasingly didactic as the movie unfolds, to the point where plot twists start to feel like they’re merely prolonging a conclusion that we all know will bear a bitter sting of irony. (By contrast, the Dardennes’ own Rosetta seems an even more remarkable achievement is exploring Kafka-esque conditions with efficiency and never having a moment that feels like The Lesson.) When we arrive at the scene where a small child, representing Romania’s future, stares up at a duplicitous adult and asks “How should I behave?”, the complexities of the film’s many braided storylines begin to seem unnecessarily extravagant. Still, I cannot help but marvel at the craftsmanship, and many of my favorite critics are promising that a second viewing will be more rewarding. More complex than Blade Runner 2049, more emotionally engaging than The Last Jedi, and funnier than any comedy I saw this year, Episode Two picks up where World of Tomorrow left off by taking the ideas that made the original my favorite short film for classroom discussion and spinning them in wild new directions. Emily Prime has become my favorite big-screen child, and her clones have the capacity to terrify us and break our hearts for their sufferings. Herzfeldt’s experimentation with colors, textures, and shapes (They Might Be Giants fans will have reason to celebrate here) take us on journeys so surreal and abstract that we feel, after the film’s brief running time, that we have been on a journey more substantial than most feature films dream of providing. While I can’t imagine a sequel that matches the perfection of the original, I’m grateful to have had the chance to revisit Emily, and grateful for these sobering warnings about where technology is taking us. Alas, I am not optimistic about humankind’s willingness to listen and heed these warnings, but for those with eyes to see, this thing will scorch your eyeballs with the truth. The windows and doors of Istanbul. That may be what brought Danny Boyle back to this, his most memorable — and polarizing — material, and what will bring this film its audience. But still, Boyle’s version of THIS IS 40 works is, in my estimation, a more interesting KNIGHT OF CUPS than KNIGHT OF CUPS was. That is to say, it’s a better representation of mid-life “What’s It All About — and How Do I Make Something Of It?” panic. I’m not sure what I’ll think of this tomorrow, but while it’s playing, this has beauty, brains, heart, and a surprising amount of soul. The marriage of colors, rapid editing, music, adrenaline, and an inclination toward compassion here reminds me more of Millions than any other Boyle circus. Cinematographer Anthony Dod Mantle shows some new moves here that are breathtaking, including a simple swerve during a confrontation between Begbie (Robert Caryle) and his son that I can’t believe I’ve never seen in a movie before; it reminded me of being startled by that brilliant close-up framing of Cruise and the Pre-Cog in Minority Report—a simple framing of two bodies in a space that makes you wonder why no one’s thought of it before (as far as you know). Sure, as with most of his work, it’s a bit too much movie and bit too short on film. I really didn’t need for this to climax with a Blade Runner-lite smackdown. Still, Boyle’s a magician. He could make a movie about a routine custodial sweep of an office building and make it more visually exciting than most action movies. Here, he’s a craftsman at the peak of his powers. P.S. You’ve got to watch the conversation between Boyle, McGregor, Carlyle, and Miller in the DVD extras, if only to watch Boyle try to explain what “meta” means to a wide-eyed McGregor and a skeptical Carlyle. And Miller sits there looking like he’d rather be anywhere else in the world. I’m rather astonished to say this about a superhero movie, and downright gobsmacked by the fact that this is a DC movie, and that Zack Snyder (my nemesis) is involved… but I really admire this film. I’m sure that I’m influenced by the fact that this is one of those all-too-rare films in which the great David Thewlis gets to play a prominent role. I think that his performance in Naked is still the most astonishing lead performance by an actor in a film I’ve ever seen. This year, Sally Hawkins gave an extraordinary performance as an afflicted woman who, disrespected and practically silenced, finds unlikely love with a “monster” of a man. No, I’m not talking about The Shape of Water, a film that I didn’t like much at all. I’m talking about a film based on a true story: Maudie, which also stars Ethan Hawke in a memorably gruff and complicated turn. If you haven’t seen it, you should. It’s beautiful. Kirsten Stewart is mesmerizing as one of the most complicated and interesting characters of this or any year. It’s a haunted house movie. It’s a stalker thriller. It’s a consumer-culture critique. It’s experimental. It’s mysterious. I can’t say I really understand it. But I was enthralled all the way through, and I have given up many hours to reading the many fascinating interpretations it has inspired. Even better, it shows that the director of the magnificent SUMMER HOURS is one of the most unpredictable directors alive. The world’s most consistently masterful filmmaking team delivers another film that quietly serves as the antidote to 95% of our available new-release options. Magnificent and timely, The Unknown Girl is challenging me take my eyes off of the soul-bruising abuse happening in the headlines hour by hour; it’s reminding me to return to the unglamorous but necessary and ultimately redemptive work of patient, diligent, disciplined love for those who need it most. Not exactly the kind of blurb that sells you on the movie, is it? Well, that’s the problem: The true and victorious power in the cosmos is the one you must seek out. It speaks in a still small voice. You have to learn to want it. And when you do, it begins to dazzle you gradually until you too become frustrated that others look at you funny when you tell them what kind of movies you like. I love the Dardennes, and while this does not yet rank for me as one of their very best, it is another incredible film that knows more about love than most films Americans will see in their lifetimes. What can I say? I laughed so hard the first time that I doubted my judgment. Was it really as smart, as intelligent, and as phenomenally executed as it seemed? Second and third viewings were just as rewarding. And in a year that was painfully short on occasions for laughter, this movie was medicine. Sorry, Christopher Nolan, but I have a new favorite Batman movie — the one that gets the character better than any others have, and that is wise enough to see the biggest problems with the whole Dark Knight mythos. The LEGO Batman Movie is many things. I expected some of them: It’s a rowdy, relentless, visually busy LEGO-stravaganza, bursting with references to every previous manifestation of the Caped Crusader. It’s a chance to turn loose the mad genius of Will Arnett, who made this masked interlocked-blockman the funniest thing about The LEGO Movie. It’s an advertisement for a dozen or more Batman-specific LEGO sets. It’s a massive commercial entertainment that makes fun of massive commercial entertainment. It’s more proof that LEGO prioritizes writing: This time, the comedy supergroup includes Seth Grahame-Smith, Chris McKenna, Erik Sommers, Jared Stern, and John Whittington. Under the direction of Robot Chicken veteran Chris McKay, it consistently serves up about 10-20 good laughs per minute for a generous 105 minutes. Holy joke-density, Batman! But the movie is also something I didn’t expect. It was the master storyteller Madeleine L’Engle, author of A Wrinkle in Time, who said that, when pondering a narrative that will illustrate complex and challenging concepts, “[I]f the book will be too difficult for grown-ups, then you write it for children.” And that is what The LEGO Batman Movie does. Whether this is intentional or not (and it’s hard to believe that it isn’t), this massive blast of hilarity acts like a stealth bomber running an urgent raid on the American conscience, trying to blast us into seeing the foolishness of looking to one egomaniac to save the day, and coaxing us to realize that the only way to hold the world together is to reach out, interlock with one another, work together, and be a community. Could it be? An animated feature film that tells a rich and fulfilling story without stretching itself past 80 minutes? That reaches a satisfying conclusion without concocting the standard frenzy of action and panic that drives the last 20 minutes of almost every animated feature from Dreamworks, Disney, and Pixar? What I love most about this is how it appeals to adults by bringing to life a story about children with the tangible materials of childlike imagination that so many of us remember from our own childhoods. These children are real to us not just because of their sufferings (which are gut-achingly painful), but because they are sculpted from the kind of Play-Doh modeling clay that made such strong impressions on our senses of sight, smell, touch, and even taste. We know these kids because we have held them. The English voice actors here, by the way, are very well chosen. Never once did I feel like the overdubbing was a cheap substitute. Also: Extra points for a creative and affecting end-credits surprise. For the first time in Pixar history, the most exquisite achievement of their animation is the beauty of their human beings. The men, women, boys, and girls in this Pixar world have a new grace, complexity, and physicality. It is better than “cartoonish,” and it avoids the common overreach that, in trying to achieve photo-realism, becomes creepy and annoying. That’s what impressed me most here. What’s more: If Pixar realizes the enormity of what they’ve done — animating a culture foreign to the majority of their audience in a way that avoids stereotype and caricature, that celebrates those traditions, and that provides context for a meaningful story — then the sky’s the limit for them in the coming years. I’m hoping they bring more and more cultures to the screen this way. It would be good for Americans to learn this way. It could help us learn to love our neighbors better, to appreciate the fabric of cultures that make up what it means to be Americans, and to reject outright any attempts by leaders to blacklist and wall off parts of our global community. Other things that impressed me: Pretty much everything. I’m a sucker for a movie about an artist fighting for the right to free expression, especially if that expression is about something larger than himself: truth-telling that heals his community. Sure, it has storytelling elements that will be familiar to Pixar fans, but a formula isn’t a problem if it’s fulfilled with love and imagination. This is my favorite Pixar film since Toy Story 3. Lady Bird is earning all the love this year, and it looks like a frontrunner for Best Picture. I won’t flinch if it wins. In a year that has called on all of us to reckon with the systemic sexism and abuse that has been accepted as normal in the world around us, why not celebrate the fact that several of this year’s best films were directed by, written by, and star outstanding women? And that’s not the only reason to highlight Lady Bird. It’s outstanding in so many ways — most of all in the way that it practices what it preaches. In a story about how love equals attention, Gerwig has lavished attention on all of her characters with such empathy and enthusiasm that even bit-part characters win our respect and understanding. My own favorites are the nun played by Lois Smith, and Lady Bird’s father, played with subtlety and heart by Tracy Letts. Letts has the hardest role to play here — he has to be depressed without letting that be his ruling characteristic; he has to be endearing without being too sweet; and he has to show some remarkable agility in navigating complex family dynamics with grace. Smith is wonderful because she’s wearing a nun’s habit and yet dodges all of the cliches effortlessly. It’s possible that this will rise in my estimation in repeated viewings. We’ll see. This film exists at an intersection between Rivers and Tides: Andy Goldsworthy Working in Time, Waste Land, The Gleaners and I, and Harold and Maude — a crossing I didn’t imagine could exist, but I’m so glad that it does. So many joy-sparking images, but none more unlikely than the close-ups of Agnes Varda in the closing moments, luminous, her face is as magical and as exquisitely detailed as that of the Miyazaki grandmother of my dreams. This is a movie for artists that can help remind us of the power of even our simplest ideas to give people the gifts of memory, identity, love, and hope. Here are two sequels that I didn’t want to see, two sequels I wished would go away, two likely cases of new movies lessening the greatness of what had come before. I just didn’t see how either movie could justify its existence, the risks it would run of diluting the original’s narrative power being too great. How would these films avoid making a mess of things that were either, in the case of Blade Runner, as perfect as dystopic sci-fi cinema gets, or, in the case of Star Wars, already a pale imitation of its original manifestation? 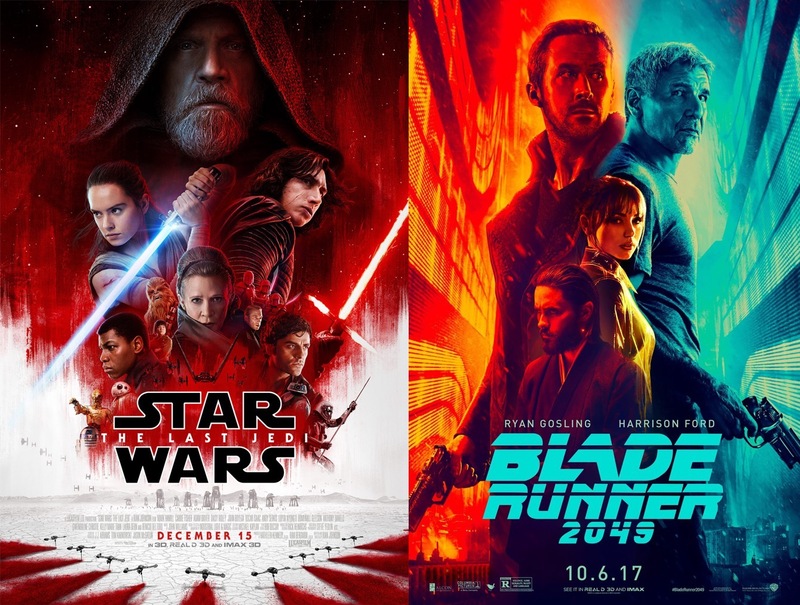 And yet, these two sequels — thanks to Denis Villeneuve and Rian Johnson — surpassed all of my expectations with imagination, visual splendor, performances that surpassed any in their predecessors, soundtracks that played vital roles, surprises that actually made sense, and enough emotional strength that I found myself genuinely caring more about these worlds than I had going in. This is nothing short of miraculous, considering the decades of pressure and the armies of temperamental fans for both properties. Okay, so both of them suffer from the same primary weakness: A strangely undercooked Top Villain who is never more than melodramatically silly. I would be a happier man if I had never met Niander Wallace or Supreme Leader Snoke. But I couldn’t wait to see both of these films again immediately after seeing them the first time, and that second viewing for both was immensely rewarding. While I still think Blade Runner is the perfectly crafted futuristic-nightmare-as-snowglobe, self-contained and poetic, and that the existence of a sequel dilutes the original’s narrative… a sequel was inevitable, and I am grateful that this one is as good as it is. It has new ideas, interesting new characters, a world that feels consistent with the context of the original but that doesn’t indulge fanboy fantasies or rely on nostalgia. It has one of the most audaciously funny fight scenes I’ve ever seen, which is a shock since Blade Runner is famously over-serious. And it gets a performance out of Harrison Ford that is so good is makes his original turn as Deckard seem bland by comparison. Villeneuve is on quite a roll. I can hardly contain my enthusiasm about the fact that he’s on to tackle Frank Herbert’s Dune next. The Last Jedi, on the other hand, had the hard job of making me care again after the disheartening prequels and a far-too-derivative Episode VII. And Rian Johnson, whose work hasn’t done anything for me since Brick, delivered. I’m dismayed that the Star Wars baton will be passed back to Abrams now, because I can only assume that Episode IX will seem safe and simple by comparison.